World’s Nicest Yugo for $7,999! Over the years, Nice Price or Crack Pipe has brought you pristine examples of some of the world's finest automobiles for your consideration. And today, breaking that trend, we have a Yugo. Yesterday, in a squeaker, 52% of you felt paying $6,000 for the '88 Samurai was preferable to not doing so. However, nobody got off the stick and did anything about it, slackers. Since you still have that six grand burning a hole in your Dickies, let's take a look at a contender that's two grand more, but about the same size, as that Suzuki. The 1980s gave us lots of things- Reagnomics, A Flock of Seagulls, and another attempt by Malcom Bricklin to start a car company. Subaru 360s, eponymous Canadian gullwings, and Bertones- Bricklin has left a trail of failed enterprises wheels-up in the roadside ditches of history. In 1985 he turned his attention to the Zastava company in Yugoslavia. 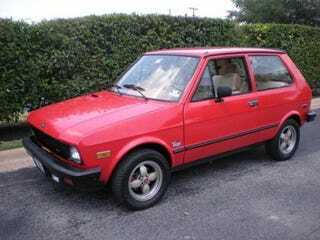 Their tiny, Fiat 128-based Yugo entered the U.S. as the cheapest new car available that year, starting at $3995. The Hyundai Excel, which debuted concurrently, was a full grand more. The Yugo rocketed into a strong sales pace that first year, but proud owners soon realized what had been omitted in order to achieve that rock-bottom price- things like quality materials, drivability, and warranty claims service. The Yugo quickly supplanted the Edsel as the biggest joke in the American automotive scene, and started showing up with greater frequency in junkyards, than on the road. But that was not before this 1986 example reached our shores, and eventually to Texas where it is currently rusting resting and posing for beauty shots on Auto Trader. Done up in communist red with a complementing taupe interior, this little hatchback comes with much of what made Yugo popular for a nano-second back during Bush I- a 1300 cc SOHC four cylinder good for 45 bhp, rubbery stick shift, and under-hood spare tire placement, pretty much guaranteeing its disintegration from heat the first time you need it. But $7,999 might seem a little steep for a bone-stock Yugo GV (which stood for Good Value) and this car does pile on the extras. There's a CD head unit in the dash, which is also emblazoned with a Gran Touring Suspension badge off of a Buick Regal, and the four spoke alloys come with smart little Abarth badges on the center caps as a cruel reminder of the kind of cars the AREN'T chosen to be brought to America. All that adds up to what is being claimed to be the nicest Yugo on the planet, which is sort of like bragging about having the biggest facial zit on prom night. But still, this is an unique bit of history, and if you're going to buy a Yugo, you better get the best one you can. So, if you were to go down this path, with AAA card in hand, and be in the market for a Yugo, would you consider this $7,999 example to be Nicely Priced? Or is that something that would come after a long night hitting the Crack Pipe, along with a facial tattoo and a Nevada marriage license? Auto Trader or go here if the ad disappears. Hat tip to aSoundofSleep!